One of the great ironies in the writing business is the persistent misunderstanding by many writers of the purpose of literary journals. Message to writers: We’re not against you; we exist for you. Here is a good example of the potential value of literary reviews. Recently I received a personal email from an aspiring poet thanking us, as the editors of Delmarva Review, for printing his work four years earlier. We had published six of his poems, as a collection, to show the strength of his voice. In his email, the poet explained that our belief in his work bolstered his perseverance to write his best work, which resulted in a publisher producing his first book, as well as his receiving a National Endowment for the Arts literary fellowship. He was excited; he shared his exhilaration. As executive editor, I felt we had received the ultimate reward for our efforts. Delmarva Review had succeeded in meeting a major objective—to encourage writers in their pursuit of literary excellence. It was working. However, my sense of satisfaction was short-lived. Later that day, I attended a writers’ reading at a local library. I enjoy hearing authors tell their stories in their unique voice. One of the writers came up to me to complain, with some bitterness, that after several repeated rejections, that person would never again submit to our journal. It was disheartening, but I listened. I explained why acceptance in Delmarva Review was competitive and to keep trying. Reliance on high standards assures a publication that earns respect throughout the literary community. That respect is totally transferrable to the writers whose work we publish. We receive thousands of submissions annually. At least two experienced editors or readers read every one of them (at no cost to the writer). If a writer’s work is accepted, it is an accomplishment. Our readers–who include writers, editors and teachers–should expect to read a higher quality of writing in a literary journal than in a standard commercial magazine or book. Unfortunately, rejection is a necessary part of the process. Any way you say it, rejection is rejection. About rejection – We editors often tell each other that experienced writers understand rejection. But, the truth is, we’re all human, and one of the fallacies of human behavior is the frequent inability by artists, experienced or not, to recognize and appraise the limits of their own writing. Self-appraisal of an author’s writing is usually tainted by bias. Hopefully, we all like our own work. That’s only the beginning. Developing the ability to make a realistic assessment and knowing where to market one’s work is very, very difficult. But, not to try assures the hardness of rejection. Speaking for Delmarva Review, we created it for the benefit of writers. “Literary” refers to writing that rises to a high artistic level. Cutting through a lot of philosophical thought, it is simply the pursuit of the best of literary art and beauty. It is beyond craft. Literary journals help assure a societal pathway toward continued literary excellence. The literary journal gives writers an opportunity to publish their best efforts, a place to showcase their highest aspirations, and to be recognized for it. At a time when so many commercial publications are retracting, or going out of business, journals offer a respected, permanent place to print the best writing a writer can create. We have no other agenda. We are independent. We are nonprofit, and our editors draw no salaries. We care about the appearance of the writer’s words on a printed page and the thoughts behind them. Above all, we hope that our discoveries become the discoveries of other discerning readers and publishers who actively seek the best writing they can find. The benefit to us is the reward of knowing that we have encouraged writers to exceed by offering a possible venue for their most creative expression. So…don’t give up. 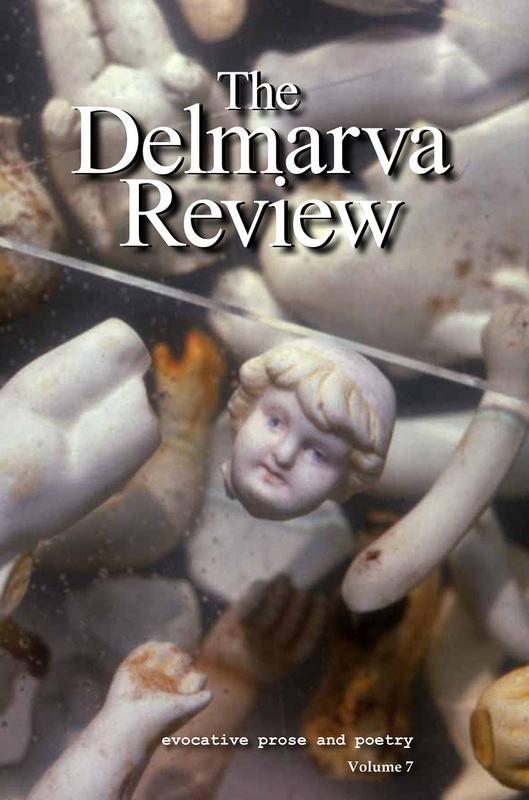 If you’re a writer, a literary journal like Delmarva Review is your friend. We take pleasure in discovering your best. Rejection may or may not be a part of that process. But, if you try, you may very well succeed at something very special, very fulfilling. 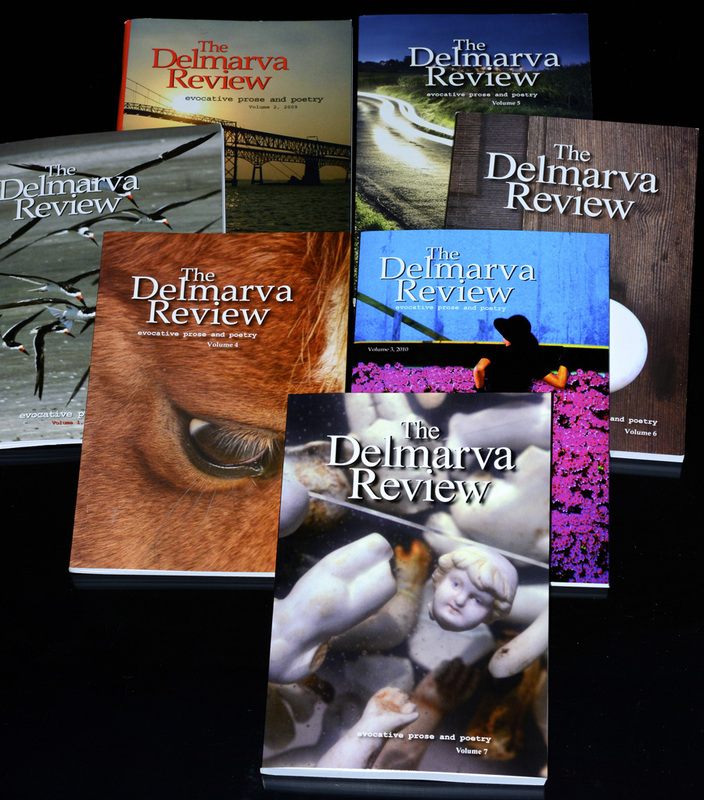 For information and submissions, see our new website: www.DelmarvaReview.org. Photographer Calvin “Cal” Jackson’s color image “Recycle” was selected for the tenth anniversary cover of the Delmarva Review, to be published on November 1. Cal Jackson’s cover image “Recycle” shows shucked oyster shells, in rustic old bushels, to spread on bay oyster beds, providing a solid hold for oyster larvae and a future crop of oysters. The photographer, from Easton, MD exhibits at galleries and shows in Baltimore, Easton, Cambridge and Chestertown, MD, as well as Brooklyn, New York. He’s a retired accountant and former audit manager for information technology with the U.S. Army. The Delmarva Review is a nonprofit literary journal publishing compelling new poetry, fiction and nonfiction from writers within the region and beyond. It celebrates its 10th anniversary edition in November. The Review is supported by the Eastern Shore Writers Association, individual contributions, and a grant from the Talbot County Arts Council with funds from the Maryland State Arts Council. The next submission period for literary work and cover art is from November 1, 2017 to March 31, 2018, for the eleventh edition. See the website for information, at www.delmarvareview.com. The Writer’s Center, in Bethesda, Maryland, honored The Delmarva Review as a literary journal in the region that produces both print and electronic issues available worldwide (via Amazon.com and other major booksellers online). The current edition, Volume 8, contains the selected literary work of thirty-five authors from 12 states, the District of Columbia and Canada. Over its eight-year history the Review has published new work from 216 authors in twenty-seven states, the District of Columbia, and nine other countries. It is published by the Eastern Shore Writers Association to promote the literary arts. A special one-hour Writers Edition on Delmarva Public Radio features two subjects: first, a celebration of the 8th issue of The Delmarva Review, a highly regarded literary journal. 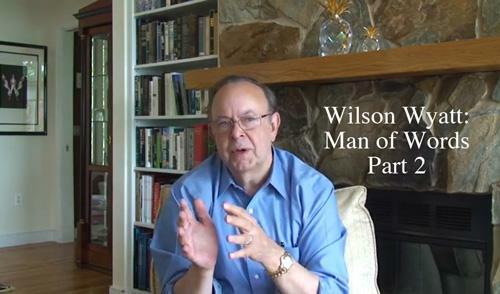 Host Harold Wilson interviews Wendy Mitman Clarke, on poetry, George Merrill, on essays, Jamie Brown, on fiction, and executive editor Wilson Wyatt about the new issue featuring 35 authors. The Review’s submissions period is open now to March 31, 2016. All authors of literary work are welcome, regardless of residence. Submissions are competitive (see the website http://www.delmarvareview.com). Part 2 of the broadcast gives writers “how-to” information and tips on “publishing your own book.” Harold Wilson moderates the discussion with authors Neal Gillen (an authority on print-on-demand publishing), Bill Gourgey, managing editor of The Delmarva Review, and Wilson Wyatt, the Review’s executive editor. All have published books using the latest print-on-demand and digital technology. 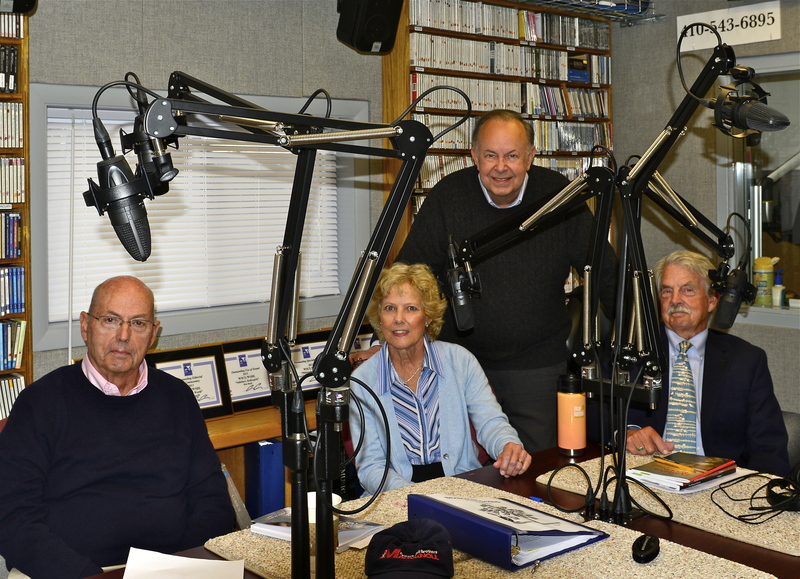 Taping “How to Publish Your Book” at Delmarva Public Radio – (left to right) author Neal Gillen, radio host and author Harold O. Wilson, Bill Gourgey, author and managing editor of The Delmarva Review, and Wilson Wyatt, author and executive editor of the Review. The Delmarva Review announced publication of its eighth annual literary journal presenting compelling new prose and poetry from thirty-five writers in 12 states, Washington, D.C., and Canada. “From the large number of submissions this year, we selected stories, essays, and poetry addressing a diversity of human themes, each one exploring the author’s unique voice and vision,” said Wilson Wyatt, executive editor. The journal opens with a conversation between poetry editor Anne Colwell and poet Sue Ellen Thompson about Ms. Thompson’s celebrated book, They. Her poetry stirs deep human emotions while presenting family and generational issues of acceptance over raising a transgender child. The cover photograph by Portuguese photographer Jorge Pereira Rudolfoelias, illustrates the timely subject. Other human themes addressed by the stories, essays, and poetry in this edition relate to individualism, birth, loss, death, grief, healing, and discovering one’s sense of place in a larger world. Published by the Eastern Shore Writer’s Association (ESWA), the nonprofit Delmarva Review has published original work of 216 writers over an eight-year history. They have come from twenty-seven states, the District of Columbia, and nine other countries. The Review opened to all writers, regardless of residence, in 2007, in order to discover and publish outstanding new literary work. The Review’s published work has earned thirty-seven nominations for a Pushcart Prize, as well as notable mentions in Best American Essays and critical journals. For writers: the submissions period for new poetry, short stories, and creative nonfiction is open now through March 31, 2016, to be considered for the ninth annual edition. Selection is competitive. All submissions are made from the website’s Guidelines page at www.delmarvareview.com. The Review’s print edition is available worldwide via Amazon.com and other online booksellers. It is also downloadable in a digital edition at Kindle for tablets, computers, smart phones, and other reading devices. Publication is supported by private contributions, sales, and a grant from the Talbot County Arts Council, in Maryland. Our Volunteers: The Delmarva Review is nonprofit and produced entirely by volunteers from the tri-state writing community. In addition to Wyatt, of St. Michaels, MD, and Colwell, of Milford, DE, the editorial board and advisors include managing editor Bill Gourgey, of St. Michaels and D.C., poetry reader Stacey Pounsberry, of DE, fiction co-editors Harold O. Wilson, of Chester, MD, and Cheril Thomas, of Easton, nonfiction co-editors George Merrill, of St. Michaels, and Cheryl Somers Aubin, of Vienna, VA, financial advisor Denise Clemons, of Lewes, DE, editorial advisors Gerald Sweeney, of Trappe, MD, and Emily Rich, of Arlington, VA and Secretary, MD, copyeditor Jodie Littleton, of Chestertown, and proofreader Charlene Marcum, of Easton. The cover designer was Laura Ambler, of Easton. Additional information about the Review and the authors, is available on the website: www.delmarvareview.com. Only two weeks left for writers to submit their best poetry and prose to The Delmarva Review. Website: www.delmarvareview.com. February 28 is the deadline for poetry, short fiction, and nonfiction submissions. Published in print and electronic editions by the Eastern Shore Writers Education Foundation (www.easternshorewriters.org), the Review is available to readers worldwide via all major online booksellers (Amazon.com,BarnesandKnoble.com, Apple, etc.). All writers are welcome. Selection is competitive. It’s that special time of year for all of us as editors. With pleasure, The Delmarva Review has nominated six authors for a Pushcart Prize for exceptional poetry, fiction, and nonfiction writing. Poetry nominations were: “Devil on an Elevator,” by Charlie Clark, of Austin, Texas, “For the Readers of Graves,” by Adam McGee, of Cambridge, Massachusetts, and “Morning Paper,” by John Palen, of Urbana, Illinois. “Widow Fantasies,” a personal essay by Randon Billings Noble, of Washington, D.C., was nominated for nonfiction. Short story nominations included “The Mythology of the Wife,” by August Evans, of Seattle, Washington, and “Robot on a Park Bench,” by Brandon Getz, of Pittsburgh, Pennsylvania. The Delmarva Review, published annually by the Eastern Shore Writers Association, in Easton, Maryland, is open to all writers. Over a thousand authors submitted writing for the 2014 edition. During a seven-year history, 60 percent of its published authors have come from the tri-state Delmarva region. In all, the writers are from 27 states, Washington, D.C., and nine foreign countries. The Review’s nominations were selected from 40 authors of poems, stories, and essays in its seventh annual edition. Pushcart editors will make a selection from all nominations to publish in the 2015 anthology, The Pushcart Prize: Best of the Small Presses XL. 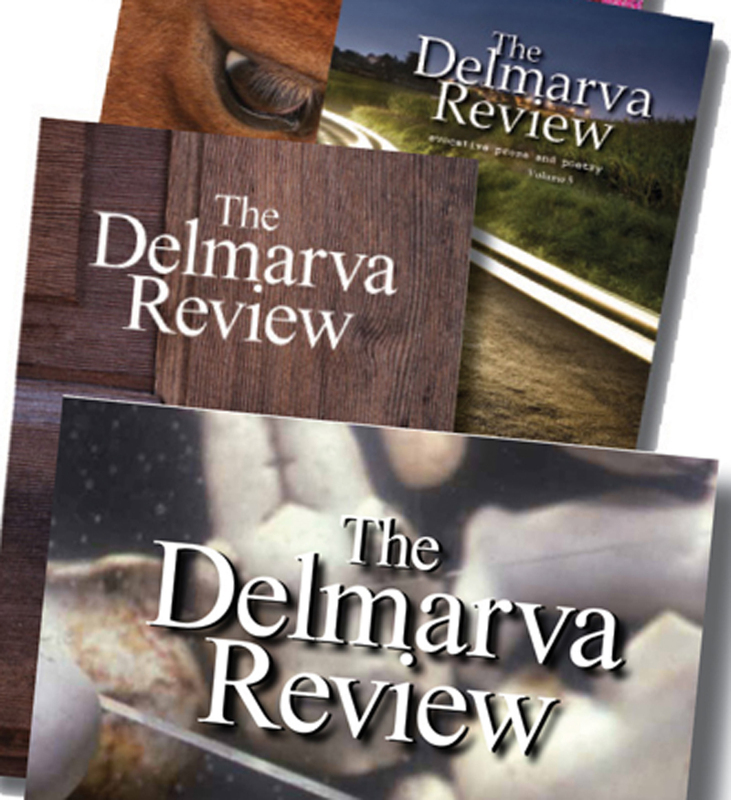 The new submissions period for The Delmarva Review is open now through February 28, 2015. A submission link is posted on the “guidelines” page of the website www.delmarvareview.com. The Review is carried by the following regional bookstores: the News Center, in Easton, MD, Mystery Loves Company, in Oxford, MD, and The Writer’s Center, in Bethesda, MD. Both print and digital editions can be purchased from all major online booksellers, including Amazon.com, BarnesandNoble.com, and Apple. The worldwide availability of the Review greatly expands the potential readership of an author’s work. The Eastern Shore Writers Association’s website is http://www.easternshorewriters.org. The organization also holds the annual Bay to Ocean Writers Conference (February 28), website http://www.baytoocean.com. “Delmarva Today – Writer’s Edition” highlighted the new issue of The Delmarva Review, a literary journal, in a one-hour radio show, which included interviews and a dramatic reading by actors of one of the short stories in the Review. Poet Wendy Elizabeth Ingersoll read from her poetry and was interviewed by program host Harold Wilson. Also interviewed were nonfiction editor George Merrill and executive editor Wilson Wyatt. The literary journal, published by the Eastern Shore Writers Association, printed an expanded edition of poetry, short stories and essays. It is available in print and e-book editions at major online booksellers, like Amazon.com, BarnesandNoble.com, Apple, and others. It is also carried by regional book stores, the News Center, in Easton, and Mystery Loves Company, in Oxford. Coming in October, the seventh edition of The Delmarva Review literary journal features the work of 40 contributors from 14 states, Washington, D.C., and Italy. Website http://www.delmarvareview.com. More news to come. Today’s digital age gives local writers everywhere the ability to reach a worldwide audience. Regional borders are disappearing. This technological phenomenon, combined with dedicated volunteers, has spawned a vibrant writer’s community across the Delmarva region of Maryland, Delaware, and Virginia. The Eastern Shore Writers Association (ESWA), Bay to Ocean Writers Conference, new critique groups, writers’ workshops, book clubs, Rehoboth Beach Writers Guild (RBWG) and many writers’ groups are growing at a healthy pace in the region. Website www.easternshorewriters.org. It’s a wonderful time to be a writer. Of course, along with opportunities for writers to reach a vastly greater readership, the Internet also gives readers more reading choices than ever before. The quality of writing has never been more important, as readers become the discerning gatekeepers of good writing. The strength of an active writers’ community is writers inspiring each other to improve their work, share marketing and distribution experiences, and become successful.